Few search engines are as privacy-focused as DuckDuckGo. Unlike Google, DuckDuckGo doesn't track or analyze your searches, and it still manages to stay very functional - indeed, after using DuckDuckGo exclusively for the past several months, I can say it's just as good as Google in most respects. However, it is missing a few of Google's best features, such as a Maps search option. Fortunately, that's changing soon. According to a blog post published by DuckDuckGo, the search engine's developers are partnering up with Apple to make Maps searches a reality. Given Apple's focus on the privacy of its customers, it's not hard to see why DuckDuckGo chose them over the competition. DuckDuckGo's reasons for choosing Apple Maps aside, let's talk functionality. Much like Google Maps, DuckDuckGo's Apple Maps integration will work in one of two ways. 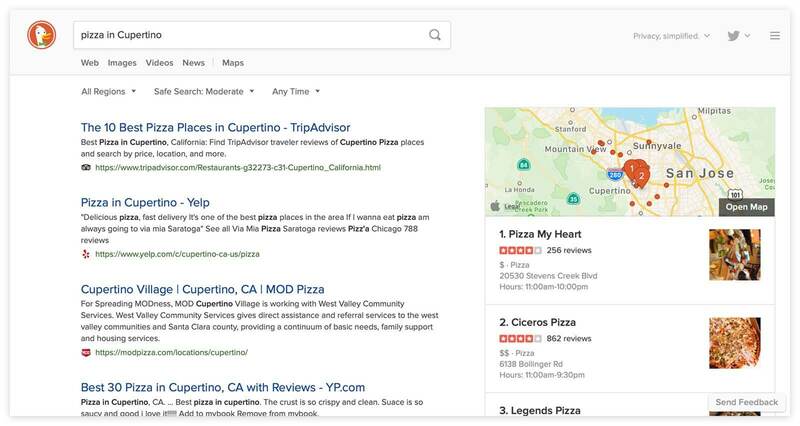 First, you can type a normal search result -- such as "Pizza in Cupertino," to use DuckDuckGo's example -- and map results will show up to the right of normal search results. Alternatively, you can use the new, dedicated "Maps" search button to bring up a full-sized interactive map. You can zoom in and out, pan around, and search for just about anything you can think of. If you repeat the Pizza in Cupertino search query, you'll now see a list of pizza restaurants on the main map as well as the sidebar. 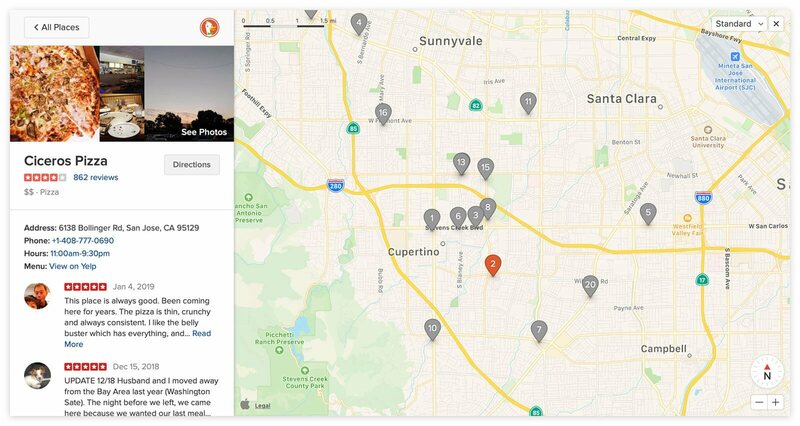 Clicking on one of the results will bring up reviews for the location (seemingly powered by Yelp), as well as address, hours, and contact information. "Given Apple's focus on the privacy of its customers..."
You seriously wrote that with a straight face? Huh? Apple has shown to be pretty good about privacy, and im saying this as an Android guy. They refuse to put in back doors for the government and iMessage is encrypted. J0hnWhyte, onestepforward and Reehahs like this. You seriously wrote that without any research? What kind of privacy is this if you cannot opt-out of iCloud for example? You could earlier, you can't now. Apple is not much different from Google spyware. Anyone with focus on privacy and keeping your private stuff off-line from rest of the world knows this. It is a constant in a way that Pi = 3.14. Furthermore, using Apple product without using their eco-system, in a 'PC way', is basically not possible - Apple/AppStore monopoly, disaster iTunes geo-locking - e.g. you can't buy movies in original version if you're outside US, with many e-books is the same problem, etc, etc, Apple BS - in a way classic example what US corporation knows & understand under 'Rest of the World' term). Apple T2 chip is nothing more than enforced UEFI SecureBoot crap with added layer of encryption. With next iteration Apple will control absolutely everything. Even now you can't install Linux on Macs when T2 is on which is simply moronic considering how many coders use Macs. And it's just the beginning. PC users will be totally screwed when M$ starts to enforce SB on PCs. That will be the day PCs die. Yeah they don't offer gov backdoors, but on the other side freely shared user data with various govs around the world many thousands of times year on year. If a court demands data and they have gone through the appropriate channels (ie. subpoena, etc.) then Apple has to comply or they'll be held in contempt of court and that can open up a whole different can of worms. If government agencies do their due diligence, file appropriate paperwork, and work through the appropriate channels Apple has to legally respond. If that's what you have a problem with then there's nothing you, I, or Apple can do about it. The law requires Apple to respond to court requests. And besides, if you're not doing any criminal-like behavior then what are you afraid of? If someone does do something bad, like what happened in Las Vegas about a year ago then yes, data needs to be handed over to government agencies for investigations.